You're in luck, due to the fact we have located, selected and archived each Embassies and Consulates in Palma de Mallorca that exist in this area. We've deeply investigated the official internet websites of each country to offer you the closest Consulates in Palma de Mallorca you need to solve the efforts you have outstanding. Each country tends to have a single Embassy within the host country, normally in the capital, and one or much more consulates commonly located in main cities. We're pretty sure that the staff at Embassies and Consulates in Palma de Mallorca speaks your language perfectly so you may not have any difficulty communicating with them. The Consulates are responsible for processing visas and permits for people wishing to visit their country and provide assistance and financial help to needy compatriots or other emergency. The premises in the embassy or diplomatic mission are kind of sacred. The host country authorities may possibly not enter the premises with no the consent of the head from the Embassy. Calle Jafudá Cresques número 8, local 2., Palma de Mallorca - Baleares - España., Código Postal: 07004. Access to this section to get a detailed listing of all Chinese consulates, embassies and representative offices situated near Palma de Mallorca. ConsulBy provides all Indian citizens with an updated and verified list of all Indian consular offices so they could contact them with any unexpected situation while in Palma de Mallorca and its surroundings. 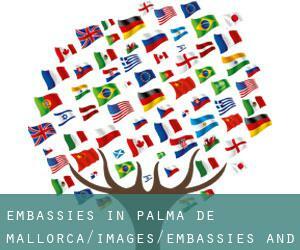 Have a look making use of this link a collection of all US embassies and consular offices placed around Palma de Mallorca, just in case you need assistance while you're abroad. Check the Nigerian diplomatic mission in Palma de Mallorca, responsible for delivering assistance and support to any Nigerian person whilst they're visiting the country. Access to this section for a detailed listing of all Russian consulates, embassies and representative offices located near Palma de Mallorca. ConsulBy supplies all German citizens with an updated and verified list of all German consular offices so they could contact them with any unexpected situation whilst in Palma de Mallorca and its surroundings. Have a look making use of this link a collection of all French embassies and consular offices placed around Palma de Mallorca, just in case you need assistance while you're abroad. Check the British diplomatic mission in Palma de Mallorca, responsible for providing assistance and support to any British person even though they are visiting the country.